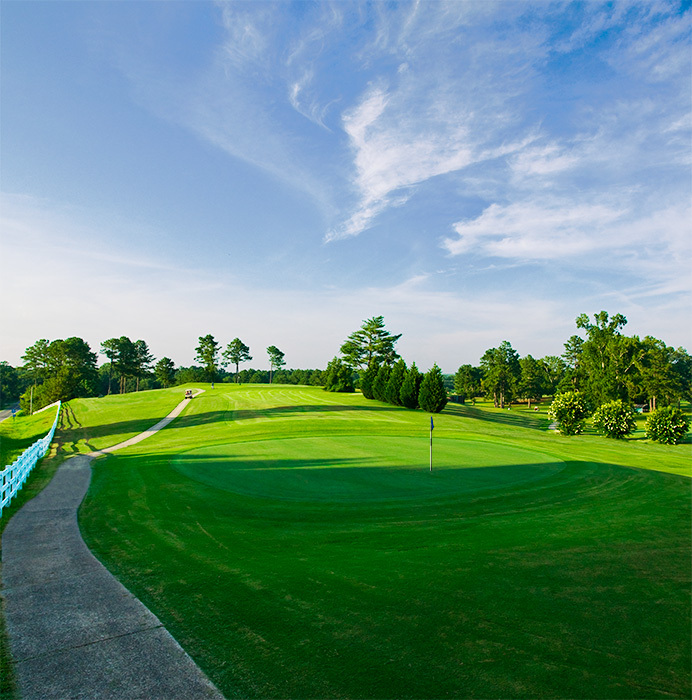 The Cross Creek Golf Course is a golden jewel right here in Alabama with full Southern hospitality! The Cross Creek Golf Course is a beautiful 18-hole course that has been rated one of the best municipal courses in Alabama by both Golf Digest Magazine and Golf South Magazine. Players consistently rave about the course and say it is a good combination of challenge and fun with its tough par 3's on the back and tough par 4's on the front. Our Cross Creek Course features stunning scenery with long greens which roll very consistently. As you go through the course, you will admire that tall beautiful trees which line the fairways. The course is short, playing just 6350 yards from the back tees, but rolling hills, water hazards, streams crossing several fairways and a few well-placed bunkers will keep you honest about your score. The course rating is 70.6 and it has a slope rating of 131 with a par of 72. For when you simply want to practice your technique and relax, we offer a club house with a pro shop, a practice putting green and a lighted driving range. Due to the clubhouses' convenient location near hole 9, you can relax in the middle of your golf game with great food and fellow golfers.